Personally, October is my favorite month. We've finally hit Fall, which means bonfires, hayrides, s'mores, and all the wonderful spooks that come out of hiding. It's also great time to brew a mug of hot cocoa and sit outside with a good book! 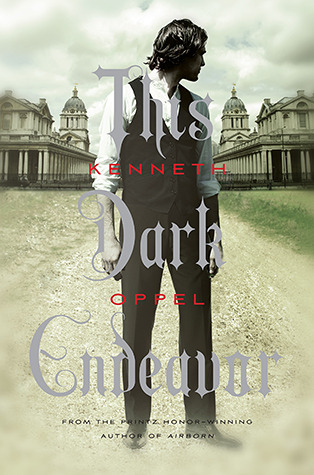 For a good October/Halloween read, I recommend THIS DARK ENDEAVOR, by Kenneth Oppel. Ever since reading the Matt Cruse series, Kenneth Oppel has been one of my favorite authors. THIS DARK ENDEAVOR doesn't disappoint. It's a page-turner that makes the Frankenstein story a lot of fun, yet doesn't lose any of its signature darkness. Even if you're not a Frankenstein fan, I highly recommend it! Find it here on Amazon, Barnes & Noble, and Goodreads. what a great recommendation for the season!!! plus the cover is awesome! glad to have found your blog, newest follower here, hi!! Thanks! It's an amazing book (and yes, gorgeous cover)! I love everything Kenneth Oppel writes. Adding this to my to-read list. Thanks for the recommendation. Not just for the story, either, but some serious inspiration for what makes a good cover!